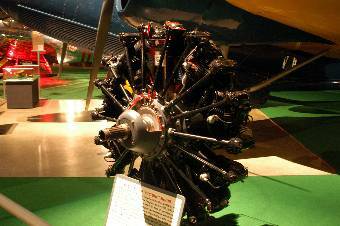 The Wright R-1820 Cyclone was an air-cooled radial aircraft engine with nine cylinders. First developed in 1931, but drawing on previous Cyclone series engines, it used Heron-type cylinders with enclosed splayed valves and had an integral supercharger and forged crankcase. It was one of the first aircraft engines with provisions for a Hamilton variable-pitch propeller. The bore diameter was f 6.125 inches (156mm) and the stroke was 6.875 inches (175mm). Aircraft using the R-1820 included the F2A Buffalo, F3F, F4F Wildcat, J2F Duck, SBD Dauntless, A-28 Hudson, B-10 Martin, B-17 Flying Fortress, B-18 Bolo, Do-24, C.XI-W and O-47.